The Nash Lighthouse (East Tower) , behind the impressive looking double horned Diaphone Foghorn. Two Lighthouses were built (1831/2), a 37 metre (east) tower and the 25 metre (west) tower , during the 1920s it was decided that the light of the west tower was not required. The lighthouses were built to keep vessels clear of the Nash Sands, which extend some 7 miles west of the headland. The sands are a major hazard to shipping. 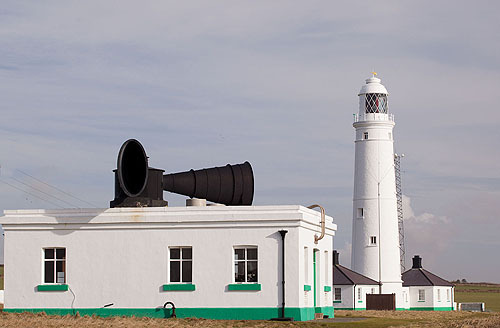 The diesel-engined, compressed air-powered, siren-type fog signal was installed in 1906 and is sounded, for the benefit of visitors, twice a month, though it is no longer an active Aid to Navigation. Since 2007 the station has been one of only ten Trinity House lighthouses which are open to the public as visitor centres. The light is white and red group flashing every 15 seconds, range of light 21 n. miles .